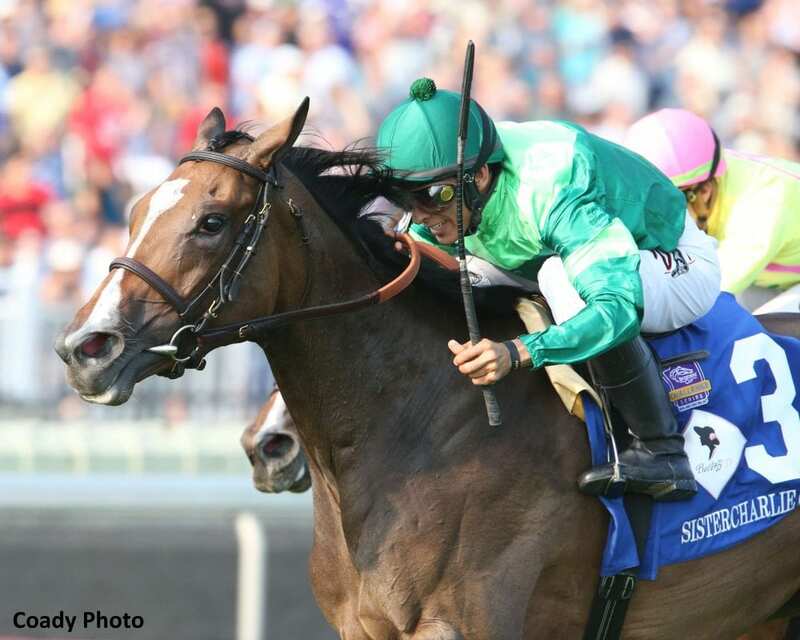 Four-year-old filly Sistercharlie moved to eighth on this week's NTRA Top Thoroughbred Poll after her third Grade 1 win of the season in Saturday's Beverly D. at Arlington International Racecourse and is the top-rated turf horse in the Poll. The Beverly D. confirmed her status as the nation's leading turf female and her consistency at the highest level this year placed her above stablemate Robert Bruce, who one race later recorded his first U.S. Grade 1 win in the prestigious Arlington Million. Trained by Chad Brown and ridden by John Velazquez for owner Peter Brant, the Irish-bred Sistercharlie garnered 81 points in Week 29 of the Poll. Undefeated Triple Crown hero Justify remained the poll's clear leader with 350 points from 35 first-place votes. Santa Anita Handicap and Gold Cup winner Accelerate ranked second with 308 points and two first-place votes. The New York-bred Whitney winner Diversify ranked third with 285 points, including three first-place votes. The only other horse to receive a first-place vote was West Coast, runner up in the world's two richest dirt races early in the year, who is ninth overall in the Poll. The full results for the NTRA Thoroughbred Poll can be found on the NTRA website at: https://www.ntra.com/ntra-top-thoroughbred-poll-august-13-2018. Full accounting of top 10 votes by voter: https://www.ntra.com/wp-content/uploads/Polls-week29-by_voter-2018.pdf. This entry was posted in NL List, Racing and tagged arlington, arlington international racecourse, beverly d, Chad Brown, john velazquez, NTRA, ntra top thoroughbred poll, peter brant, sistercharlie by NTRA. Bookmark the permalink.